Notice I skipped “Lunch Ideas”? 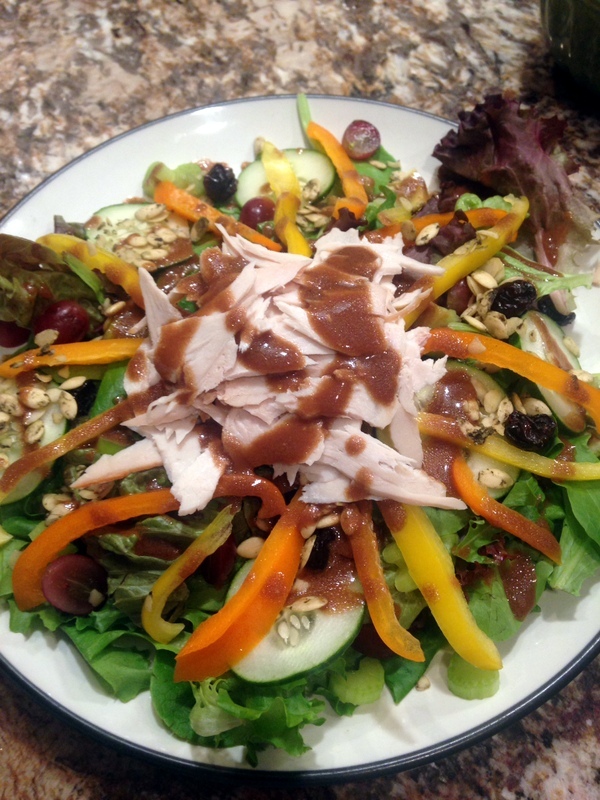 Well, I eat the same thing for lunch every day: a big green salad with turkey (My favorite is the in-house roasted turkey at Whole Foods) and a homemade balsamic vinaigrette. On to my dinners this week. 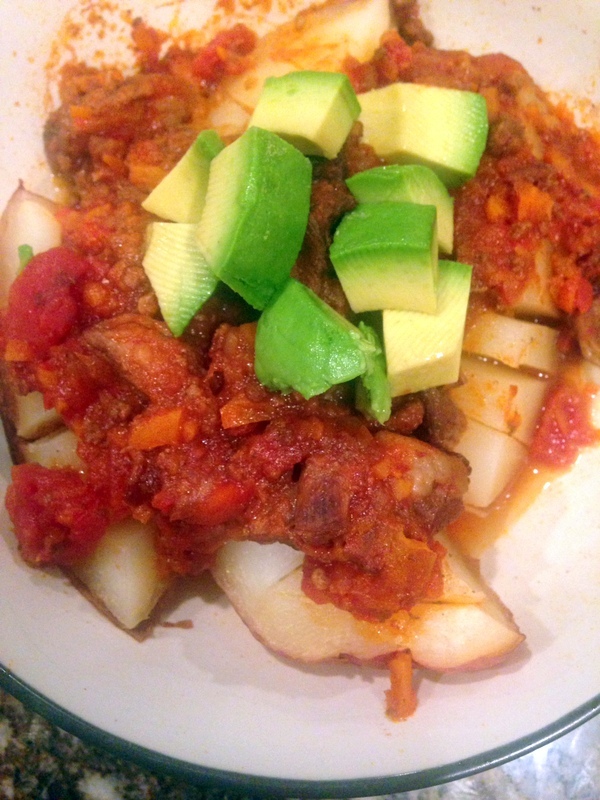 Baked potato topped with chili from Paleo Comfort Foods and avocado. A spicy, veggie-filled chili. I added diced carrots as well. 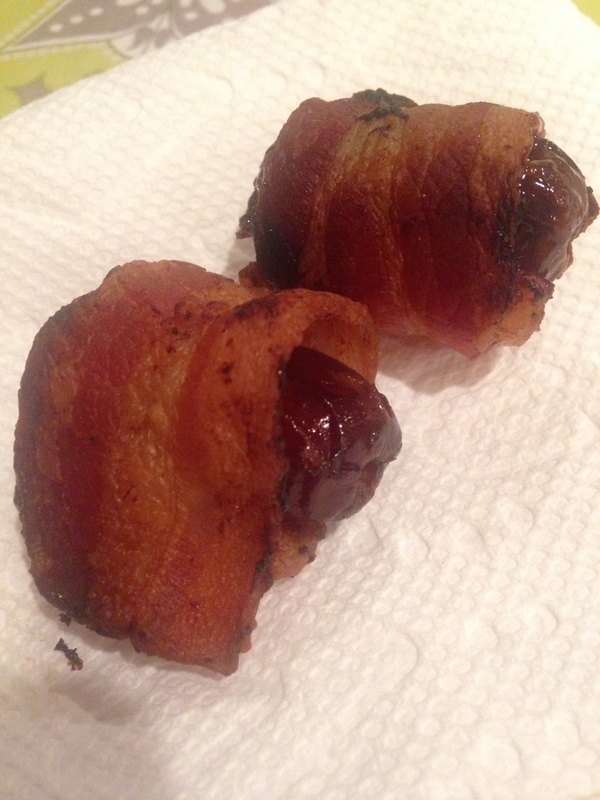 Bacon-wrapped dates. What!? These are my new favorite snack, and so easy. Two ingredients – bacon and pitted dates. I had a few after my chili. Lovely dessert! 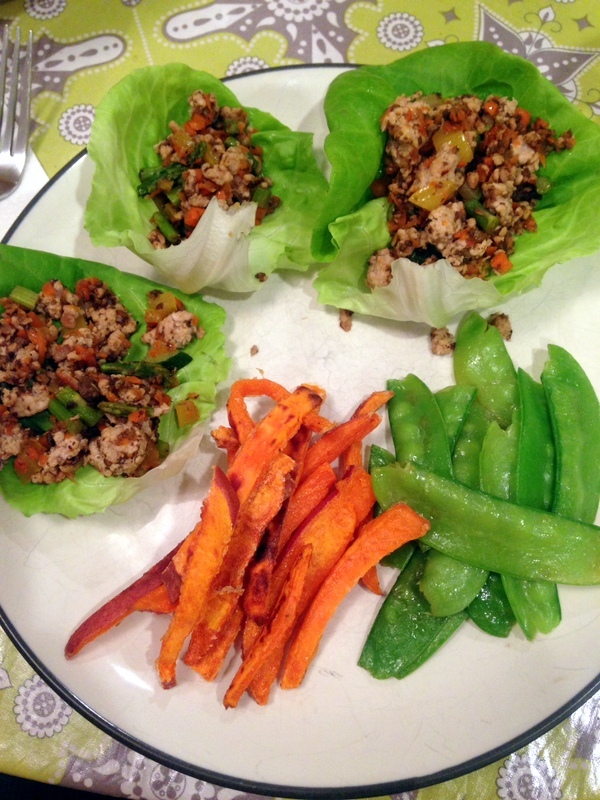 Asian-flavored lettuce cups (ground pork, yellow peppers, asparagus, carrots, portabello mushrooms, garlic, ginger, zucchini, and coconut aminos), Ginger and garlic sweet potato oven fries, and snow peas sauteed with coconut aminos. It was my first time trying coconut aminos as a sub for soy sauce. Loved it! Got started on dinner late this night, so I needed something quick and easy. 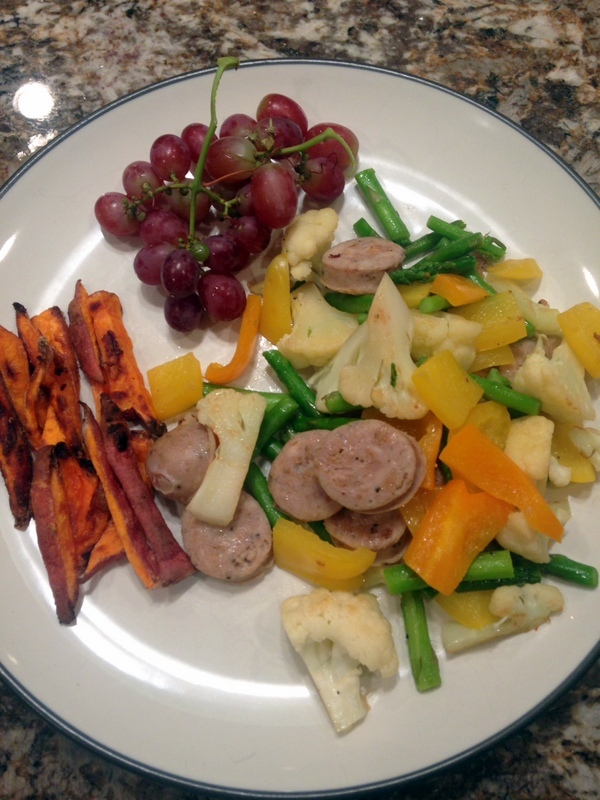 I sauteed a bunch of veggies (cauliflower, asparagus, peppers, and chicken bratwurst), leftover sweet potato fries, and grapes. 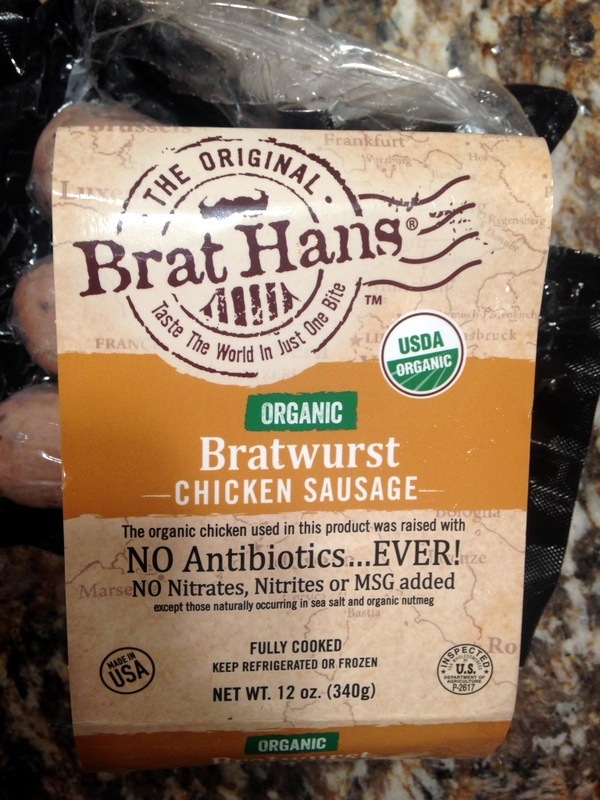 The chicken bratwurst I used in the dish above. Highly recommend! I found these at Whole Foods – of course. My favourite from this post has to be the bacon wrapped dates, yum 😊. This entry was posted on November 8, 2015 by healthyfoodie and tagged dairy-free, gluten-free, grain-free, health, mypaleo30, nutrition, paleo, paleo dinner ideas.